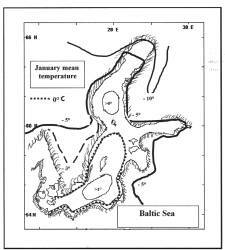 In this study the Baltic Sea is given the same climaticimportance as given to the North Sea, insofar as the formerplays a key role in determining winter conditions in Northern Europe. Therefore full reference is made to the relevant paper. (A) Further, the Baltic Sea has features that are very different from those of the North Sea. Some of these most significant aspects, relevant to the situation in the autumn of 1939, will be briefly discussed in the next section. Thereafter, main military activities and meteorological events relevant to the issue, will be mentioned and analysed, even thoughthis is not always done in a chronological order. The ‘List of events from September 1939 – March 1940’ given at the end of this section refers to most relevant or interesting events only. To aid understanding, it seems reasonable to give some early attention to the historical list below, the special study on the Finland-Russian war in December (B) and other papers on naval activities in 1939. (C) A similar approach is adoptedwith regard to ice conditions in the Baltic. While some general situations of ice cover in the winter of1939/40 will be discussedhere, icing of the Baltic Sea during the three winters from 1939 to 1942 will be dealt with elsewhere. (Chapter D) After all, icing of the Baltic Sea during the winter of 1939/40 was the severest in many decades and together with following winters constitutes core evidence to suggest that the war machinery certainly caused climatic changes observed since the start of WWII. Further details: (A) North Sea cooling, 2_16; (B) Russian - Finnish war, 2_41; (C) War at sea 1939, 2_13, Sea mines, 2_14, Bombs and depth charges, 2_15; (D) Winter 1940/41, 3_11, and Three years package, 3_31. The total area of the Baltic Sea is 400,000 square kilometres with an average depth of 55 m including the Gulf of Bothnia (55-294 m) and the Gulf of Finland (lower than 30 m). The southern Baltic, except Gdynia Bight (114 m), is less than 50 m deep. Climatically the most important feature of this sea is a high mountain ridge from north to south Norway with a height of 2,500 m. Behind this barrier, continental and polar air have much easier access than in areas where Atlantic air travels east at a low elevation level. This frequently guarantees mild summers to Baltic countries by significantly delaying thearrival of continental winter conditions. The mountain ridgealso preventsheavy winter conditions by preventing theinvasion of Arctic air masses with very high surface fluxes of sensitive heat and moisture that can reach conditions common to those, which exist in the Arctic. Thereis hardly any other sea in the northern hemisphere, which can convincingly demonstrate theimportance of heat storage and release process as the Baltic Sea. Actually, very cold conditions cannot prevail on sea and in nearby coastal areas over a longer period as long as the sea is open andnot iced. Icing is a very critical point in the regional climatology. Every sea area covered with ice loses ten times less energy to the atmosphere than an open sea area. The importance of heat flux can be clearly demonstrated by temperature data records that show that winter average at the seaside is considerablyhigher than further inland, whereby the temperature sometimes decreases in great leaps, i.e. by 1°C per 50 km or more, depending upon the distance from the coast. From mid September to the end of February, when theair is colder than the seawater, the water temperature decreases between 13°C and 15°C, whichis significantly more than that of the North Sea (9.5-11.5°C). Thisactually means that the surface temperatures with an average ranging between 0°C (north) and 3°C (south) in January quickly come close to zero. Heat stored at lower levels exists but is negligible. Deeper waters, 80 metres and below, have just 4-5°C, while the water column above varies according to the seasons. These temperature changes through the seasons are effective from the surface to about 80 m depths. While surface water reaches their peak temperature by the end of August, lower levelsmay reach itspeak later on (e.g. 40 m, with 10°C in late October). All activities that took place at sea in September thus could have forced considerable warm water masses to greater depths, which may have delayed the icing process by days or even weeks. TheGerman Navy assembled within sight of Gdynia at dawn on September 1, 1939 with afleet ofabout 40 ships. At 4:45 a.m. battleship Schleswig-Holstein started shelling the Westerplatte with big calibre guns. After 13 days of pounding shells from sea to land and coastal batteries shooting at the armada of naval ships out in the Baltic, Gdynia fell. Thereafter, other positions along the Polish coast were shelled fiercely from the seasmaking their defencesin vain. With the shelling of Hela (Gdanska Bight) by two German battleships from September 25-27, the last Polish coastal defence position was silenced. Within four weeks, the Germans had brought the entire Southern Baltic coast under their sole control. How much of the several thousands of tons of ammunition fired exploded on or under the sea surface is difficult to assess. Substantial areas of the sea affected were certainly stirred and mixed heavily. Heavy exchange of shelling for almost four weeks at a sea area with depths down to 114 metres could have severely altered temperature compositions, normally ranging from 17° C at surface, to 4°C at bottom at the end of August (at 20 m ~14°C; at 30 m ~8°C, at 40 m ~6°C). It would be a miracle if heavy shelling had not forced warm water into much deeper water layers and colder water to the upper layers. 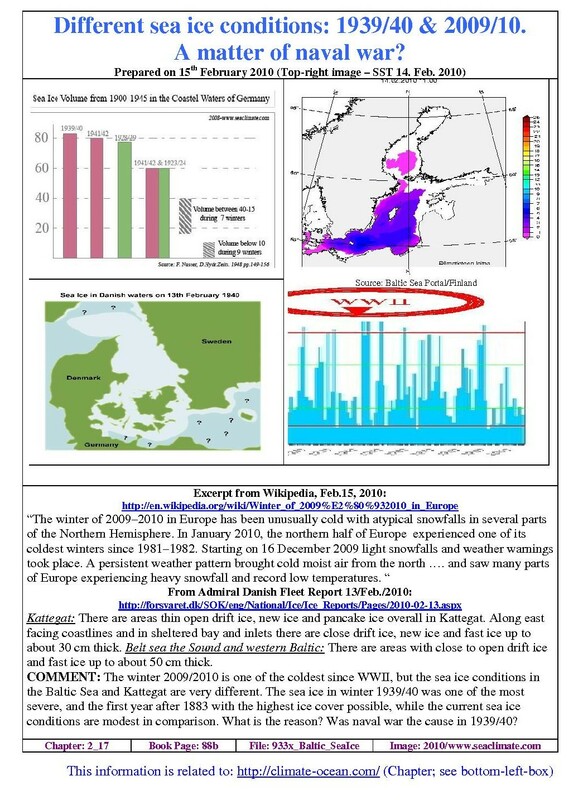 Under such circumstances it seems totally unavoidable that since the start of war considerable parts of the south-eastern Baltic must have hadmuch lower water temperatures than usual. The following evidences suggestthis: (1) freezing temperature at Rügenwalde (about 150 km west of Gdynia) on September 26, and on October 4,1939 at Königsberg/Kaliningrad (see below: Events), (2) icing of the sea at Gdanska Bight started by mid December, which although early, doesnot indicate immediately any extreme situation. This could have been due to the fact that masses of surface water, forced into greater depths in September, may have returned back to surface at a later time. In this respect it should be noted that icing process started earlier in North Germany (see below: Events, Dec. 18 – 28) and along the southern Baltic coast (early Jan. 40), while the Gulf of Finland was still open as far as Pellinki, until January 17, 1940, when icing started very rapidly. All waters along the Southern Baltic coast were put under severe stress from September 1, 1939 onwards. The German Navy was navigating the waters extensively. Theyused these waters to train tens of thousands of their naval personnel, including firingbyguns into designatedsea areas. Many mine fields had been laid towest of the island of Rügen and Trelleborg. The Danish government had also arranged for laying ofmine fields in the three navigation channels of Copenhagen. (NYT, 03 September, 1939). Even thoughwater is shallowerwest of Gdanska Bight, the war could have had a considerableimpact onthe southern section of the Baltic Sea asexplained. An indication of the impact onweather exerted by all these activities is the early icing in the western Baltic (since December 18) and its lasting longer than usual, until the end of March, 1940. In addition, water modification in the Southern Baltic wouldcertainly have contributed to weather changesin the sameway as in the North Sea (A), particularly in supporting a ‘corridor’ of increased continental air pressure (B), which culminated in a lasting independent cold air plug close to the southernBaltic Sea for six weeks; see below: Events, 15 January, 1940. Further details: (A) North Sea cooling, 2_16; (B) Lost West Wind Drift, 2_12. Extraordinary developments in the high North during December 1939 have been studied elsewhere. (A) How many unusual meteorological eventsare necessary assufficient proof that war changed weather? Here are some of the events: On November 30, 1939 the Red Army attacked Finland at a number of locations along a 1,000 km long border, running north–south, from the Barents Sea to a point east of Vyborg. Red Army strengths was 300.000 men and more. On December 1, the Red Army bombed cities; on December 2, snow startedfalling; on December 4, “blinding snowstorms” affected fighting; and the first cold period lasted from December 7-15. When weather had cleared for the first time after two weeks, thisimprovement in weatherwas immediately utilised for intensive bombing and fighting missions on 19th December. The secondextreme cold wave entered the scene on the next day. “The Russian drive was stalled in the far north by blizzards and temperatures 25 degrees below zero (minus 31° C). (NYT, 21 December 1939). This was only the beginning andit became much worse. Unbelievably extreme weather conditions were reported. (A) However, as much as there is no political excuse for the invasion of Finland, it would be wrong to call the Russian decision to invade Finlandin early December ill judged. Actually, according to all indicationsavailable at that time, there was nothing to suggest that such extreme weather would happen. Neither was there anyprecedent indicating that it could happen so suddenly and so early. Normally, theaverage temperature in December in Murmansk is about -10°C; and average low temperature there in December is -13°C; whichis still much warmer than -35°C reported in December 1939. (NYT, 25 December 1939). A selection of numerous naval and military activities in the northern Baltic Sea that presumably playeda major role in the relatively late icing of the Gulf of Finland is listed in the relevant paper (A), while the main conditions in regard to icing in the winter of 1939/40 are dealt with in the next paragraph. Further details: (A) Russian-Finnish wars (2_41). The Baltic Sea had not been covered with as much ice since 1883. The coverage 1939/40 was tremendous exceptional. Ice did not start retreating until around March 8, 1940. The conditions for building up of ice differed in three ways from the average of previous years. 1) Even though ice started to form in the very North very early, solid ice developed at the usual time; 2) Ice formation started at first in the southern Baltic Sea, and 3) Icing in the Gulf of Finland followed rapidly with a cold wave of14 –24 January 1940. In the South, at the Greifswald Bodden (an open bight SE of the island of Rügen), icing started on December 18, 1939, solid ice remained in place without any interruption until April 4, 1940, and last ice disappeared on April 11, 1940. In Hanko/Finland (at the west entrance to the Gulf of Finland), icing started on December 27, 1939; solid ice formed on January 4, 1940; end of ice cameon May 7, 1940.; at almost the same time as Helsinki. However, on January 15, 1940 the Gulf of Finland was still open as far East as the median of Pellinki. In the Gulf of Bothnia, the sea was also open in most parts. Ice then formed rapidly. Just to remind. Although the Gulf of Bothnia is far in the North it is with over 200 metres – in the Baltic Sea area -the deepest water, holding considerable heat for considerable time even in cold winters. An ‘ice-bridge’ between Turku and the island of Åland formedon January 6/7, 1940, which is about 2 ½ weeks earlier than usual. There is no other validexplanation for any deviation in weather from earlier averages than the war activities at sea. Most of the factors relevant tothe Baltic Sea are the long open sea areas in the Gulf of Finland, a clear indication that, due to military activities a high mixing of water took place preventing the formation of ice. On the other hand, early formationof the ‘ice bridge’ showed that water of that area had already cooled enough to freeze, in this case, more than two weeks earlier than a place like Hanko, less than 100 km away. Being land locked and located in the far north, the Baltic Sea is particularly sensitive to water heat. This became very obvious during the next winter of 1940/41 when, during initial months of the war, the sea was not made a major battle ground. Winter cold centre shifted ‘a little bit’ further west to the Skagerrak and South Norway region. (A) The Baltic Sea’s climatic sensitivity in the events of ‘turning the water about’, became particularly obvious in the war winter of 1941/42, when the German Navy battled with the Russian Baltic Fleet for supremacy over the sea from the summer of1941 until the winter of 1941/42. (B) It was colder than even during the Little Ice Age. (C) The Baltic Sea was used as a great style field for the experiment on anthropogenic climatic forcing. It proved to work after four months of naval activities in 1939. Further details: (A) Arctic by occupation, 3_11; (B) Baltic battle field, 3_21; (C) Stockholm’s record freeze, 3_23. 24 September 1939; Snowfall in Baltic countries. A low pressure (1,000mb) originated in the western part of the Gulf of Finland, with wind force 6-8 Beaufort near Sundsval and Åland Island. 26 September 1939; Temperatures: atRügenwalde (small city at the Baltic coast, 150 km west of Gdynia) on 26th September: -0.4°C; on 27th +1.5°C; in Koenigsberg/Kaliningrad 25-27th, (+2.5° C to +1.6°C). Putbus (Rügen), 24-29th (+5.2°C to + 3.8°C). 27 September 1939; Hamburg –2.5°C. 11 October 1939; A high pressure over Finland brings cold air of arctic origin to East of Germany, Koenigsberg (Kaliningrad) - 3°C average. Within the range of this cold air first light snow occurred in the Gdynia Bight. Actually, Koenigsberg had already experienced-1°C on 04 Oct..
Mid-October 1939: Some lakes and rivers froze in Northern and the middle of Norrland/Sweden, as well asin NW of Svealand (Middle Sweden), which usuallyhappens only towards the end of the month. 01 November 1939; Together with the first snow showers in the eastern Baltic, cold air had been carried as far as the line Bohemia – Helgoland Bight. 19 November 1939; Danish Light vessel Anholt Knob (Kattegat) reported snow fall. 26 November 1939; Danish Light vessel Anholt Knob (Kattegat) reported snow fall. 01 December 1939; First appearance of ice in the Baltic was indicated by reported withdrawal of Helsinki Light Vessel from its station. 04 December 1939; Navigation closed at Kotka (Gulf of Finland). 07 – 15 December; Light vessel ‘Skagens Rev’ reported frost on 6 days during 7-15 Dec.
08 December 1939; Navigation closed at Kalix, Northern port in the Gulf of Bothnia. 11 December 1939; Navigation closed at Oulu. Last vessel sailed December 7. 17 December 1939; In Hamburg temperature sank to minus °7C. 18 – 31 December 1939; In Denmark, sea water temperatures dropped tobelow zero degree Celsius (selection): Aalborg 5 days (max low -1.6°C); Rodby Havn 7 days (max low. –0.6°C); Fredrikssund 7 days (max low. -1.8°C); Klinth Havn 3 days (max low. -0.5°C). December mean temperaturesat 08 a.m. for all Danish coastal stations are between +1.7°C and + 5°C. 19 December 1939; Ice, which was reported inKiel Channel (from Elbe to Kiel), Lübeck and Travemünde, remainedfor almost three months. 19 December 1939; Navigation closed to several ports in the Gulf of Bothnia, except with icebreaker assistance until end of December or middle of January. 21 December 1939; Ice reported in Schlei (north of Kiel), was to stay until 31 March 1940. 26 – 31 December 1939; Most Danish light vessels reported permanent frost (max -6.3° Lappegrund). 27 December 1939; Reported from Tallinn that Leningrad harbour wasclosed owing to ice. 28 December 1939; Ice which was reported in Flensburg (at Danish border) lasted till28 March 1940. 2 January 1940; Narva and several other Estonian ports report fast ice; navigation closed. 9 January 1940; Heavy ice in Riga –navigation only possible for powerful steamers. 13 January 1940; Gulf of Bothnia. A minesweeper and two patrol boats dropped depth bombs in an attempt to cripple a Russian submarine, which had trailed the small Finnish steamer, Bore, through the international water of the Gulf of Bothnia. (NYT, 14 January 1940). 15 January 1940; Palosuo’s meteorological assessment reads: By 15 January, the atmospheric pressure in Greenland had reached a remarkably high level. As a low pressure simultaneously prevailed in Central Russia very cold air began to flow westward at high speed from the northern side of this low pressure, and a very severe frosty period began inthe region of theBaltic. The outbreak of cold air resulted in an independent cold air pool (“Kaltlufttropfen”) in Germany which persisted in the area for nearly a week. The cold air pool in the German area began to move on January 24 towards the Baltic region from where, reinforced, it pushed back to German territory on February 7. OnFebruary 12, its centre was in the region of Hamburg, from where, moving slowly, it arrived in East Germany about February 20. 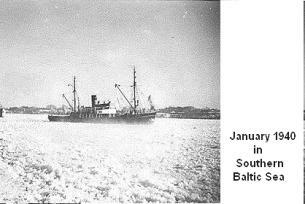 17 January 1940; Heavy fast ice recorded at Tallinn and Riga. 17 January 1940; Copenhagen harbour full of firm thick ice. Extremely difficult conditions reported for shipping in all Danish waters. 23° frost reported during the night in Denmark. Baltic Sea frozen over as far as can be seen from Danish coast. 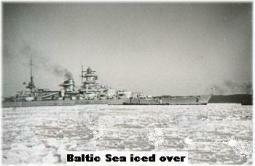 18 January 1940; Heavy ice reported in the sea off Riga and in Tallinn. By the middle of January 1940 the first severe cold spell was firmly established. Further details: Conditions in Europe Winter 1939-40, 2_11.